The children were nestled all snug in their beds, While visions of sugar-plums danced in their heads; And mamma in her 'kerchief, and I in my cap, had just settled down for a long winter's nap, When out on the lawn there arose such a clatter, I sprang from the bed to see what was the matter. Away to the window I flew like a flash, tore open the shutters and threw up the sash. The moon on the breast of the new-fallen snow gave the luster of mid-day to objects below, When, what to my wondering eyes should appear, but a miniature sleigh, and eight tiny reindeer, With a little old driver, so lively and quick, I knew in a moment it must be St. Nick. More rapid than eagles his coursers they came, And he whistled, and shouted, and called them by name: "Now, Dasher! Now, Dancer! Now, Prancer and Vixen! On, Comet! On Cupid! On, Donder and Blitzen! To the top of the porch! To the top of the wall! Now dash away! Dash away! Dash away all!" As dry leaves that before the wild hurricane fly, When they meet with an obstacle, mount to the sky, so up to the house-top the coursers they flew, With the sleigh full of toys, and St. Nicholas too. And then, in a twinkling, I heard on the roof the prancing and pawing of each little hoof. 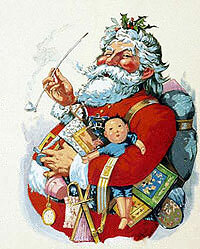 As I drew in my hand, and was turning around, down the chimney St. Nicholas came with a bound. He was dressed all in fur, from his head to his foot, and his clothes were all tarnished with ashes and soot; A bundle of toys he had flung on his back, and he looked like a peddler just opening his pack. I raised my double-barreled shotgun, and fired two blasts!